The customer portal is a secure place where your customers can manage their own account information. Every PayWhirl account comes with a unique customer portal hosted at "https://company-name.paywhirl.com" that can be accessed from any device on the internet. 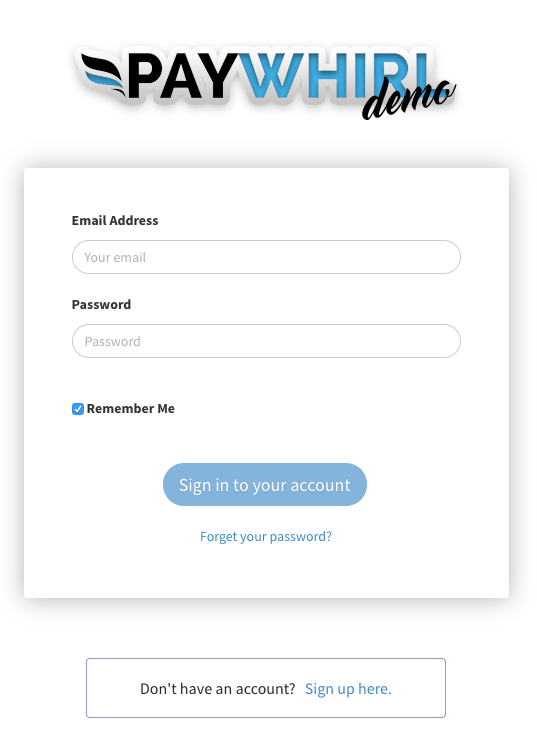 You can ALSO embed a customer login widget (like we do in our portal demo https://app.paywhirl.com/demo/customer-portal) into a page on your website so your customers can login securely without ever leaving your website. OR... If you don't want to embed the portal login into your website, you can always link directly to the hosted version on the web. You can also integrate an existing website login (if you already have one) to work with your PayWhirl customer portal login so customers only have to login once. For example, if you use an ecommerce platform like Shopify or Bigcommerce customers will technically have TWO different places to manage account information. However, because we create customers in those systems when they make a purchase, customers will have the same credentials for both systems and can login to either/both with the same information. Find your website's "my account" pages (display after customers login). The files are usually in your theme files on Shopify, Bigcommerce, Etc. Load the customer login widget when customers click the link and/or load a sub-section at this point with the paywhirl customer portal login widget. When you integrate the PayWhirl login INSIDE the native theme login it just feels like an added security step (which it is because customers are about to access a secure area within your website, with their stored payment information) and most customers don't even think twice about it, as this is becoming more and more common everyday (2 factor authentication). Most customers will have no problems because their credentials will be the same in both systems. It's a quick and inexpensive solution that will work for MOST businesses that use PayWhirl. With our MultiAuth API endpoint you can automatically login customers and direct them to widgets and/or pages within the customer portal if you need.